With a lot to like and very few downsides, the 2U Primergy RX2540 M1 represents good value for anyone looking for a flexible data centre workhorse. Servers based on Intel's Haswell-based Xeon processors are fast becoming commonplace with all the big vendors (and most of the small ones) having now refreshed their product lines with the new silicon. 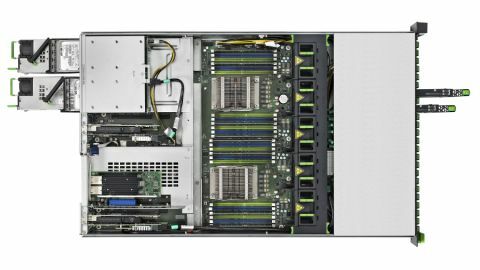 Not least Fujitsu, which added the RX2540 M1 to its Primergy line-up at the start of the year to better meet the needs of businesses looking to host demanding compute-hungry applications. Built to the usual high standard expected of a Fujitsu Primergy server, the RX2540 M1 is a 2U rack mount beast, delivered in the now familiar black and green livery of the Primergy family. Designed for tool-free maintenance, the top simply lifts off for ease of access and there are dual redundant power supplies which slide into place at the rear. The review system came with 800W supplies, although lower (400W) alternatives are available, and higher – 1200W – for more power-hungry configurations. The processors account for much of that power consumption with two sockets to take Intel E5-2600 v3 Xeons, managed by an Intel C610 chipset. Ours came with a pair of E5-2660 V3 chips fitted, these midrange 2.6GHz processors equipping the server with a total of 20 cores/40 threads for a relatively modest TDP of 105W per socket. Of course you don't have to stick with these chips. Indeed, a further 20 processor SKUs can be specified, ranging from 6 to 18 cores per processor at varying clock speeds to suit a variety of workloads. But watch out for heavy price penalties at the high end as these can add significantly to the overall cost. Memory can be costly too, as in addition to the new Xeons, the latest ultra-quick DDR4 RAM is employed on this server with, as might be expected, ECC protection as standard. Up to 768GB can be accommodated in total, in 24 DIMM slots, the review system shipping with a decent 128GB on just eight 2133MHz RDIMM modules. Yet more care is needed when it comes to storage, with different chassis configurations required depending on the number and physical size of drives you want to support. Go for 3.5-inch disks, for example, and you can have four, eight or twelve bays, with four located at the rear of the chassis on the 12-bay model. Opt for 2.5-inch and you have exactly the same choice of setups – the 2.5-inch disks screw into the same caddies as the larger disks – plus a 24-bay chassis with disks mounted vertically for database and other storage-heavy applications. Just make sure you order the right configuration at the outset as upgrades are not possible for every combination. In terms of the disks themselves there's the usual suspect list made up of SATA and SAS magnetic disks plus SSDs in varying capacities. Ours had four 300GB SAS drives, in 2.5-inch format with a 15K spin speed. The disks can all be cabled to the integrated controller but, on this type of server, a plug-in RAID adapter is more usual. To this end the review system came with one of Fujitsu's own, a PRAID EP400i card based on an LSI 12Gbps RAID-on-Chip processor offering RAID levels 0,1,5 and 6 with optional flash-based backup. Of course all this hardware can generate a lot of heat so cooling is looked after by a bank of five hot-swap fans in the centre of the chassis plus a couple of smaller fans in the power supplies. These make the usual jet engine "woosh" as the server powers up, but otherwise, proved no noisier than those employed in other rack-mount systems we've tested. The RX2540 M1 also features Fujitsu's latest Cool-safe Advanced Thermal Design (ADT) technology, supposedly enabling it to operate in relatively high ambient temperatures of up to 40 degrees Celsius.